A Buxton man whose car crashed into a wall after he accidentally let the handbrake off when drunk has been fined. Police were called to a car park at Corbar Hill House, Buxton, in the early hours of October 18, prosecutor John Cooper said. 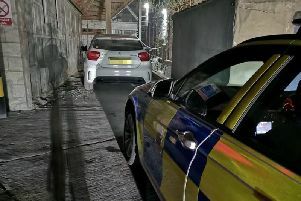 The car’s owner Niall James Hulme failed a roadside breath test and was taken back to the police station, where he provided a reading of 76, the legal limit is 35. The 24-year-old, of St James Terrace, admitted being in charge of a motor vehicle when his alcohol level was above the legal limit. Saul Comish, defending, said Hulme had been at a friend’s house and as he set off to walk home, remembered his keys and wallet were in the car. But as he leant into the vehicle to retrieve the items, he accidentally released the handbrake and the vehicle rolled into the wall, he added. Hulme was fined £180, ordered to pay a £20 surcharge, £160 costs and given ten penalty points on his licence.